Dog-friendly restaurant with three fire pits and acoustic music. Sunday 12pm-6:30pm: Buy a pitcher of beer or bottle of wine and get a free cheese pizza. $1 off pints, wine, and appetizers. 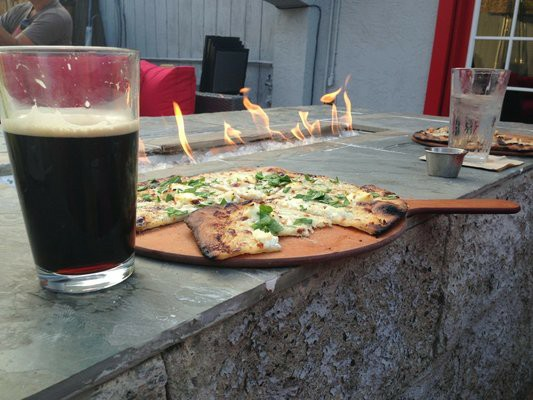 Monday 4:30pm-10pm: Buy a pitcher of beer or bottle of wine and get a free cheese pizza. $1 off pints, wine, and appetizers. Tuesday 4:30pm-6:30pm: Buy a pitcher of beer or bottle of wine and get a free cheese pizza. $1 off pints, wine, and appetizers. Wednesday 4:30pm-6:30pm: Buy a pitcher of beer or bottle of wine and get a free cheese pizza. $1 off pints, wine, and appetizers. Thursday 4:30pm-6:30pm: Buy a pitcher of beer or bottle of wine and get a free cheese pizza. $1 off pints, wine, and appetizers. Friday 12pm-6:30pm: Buy a pitcher of beer or bottle of wine and get a free cheese pizza. $1 off pints, wine, and appetizers. Saturday 12pm-6:30pm: Buy a pitcher of beer or bottle of wine and get a free cheese pizza. $1 off pints, wine, and appetizers. Thursday 4:30 p.m. to 9 p.m.